The shortlisted artists for the inaugural Julia Carter Preston Prize have now been announced. They are Lanty Ball, Yasmin Lennon-Chong, Jane King, Susan Nemeth, Malene Hartmann Rasmussen, and Jo Taylor. They will also have the opportunity to win a prize of £1000, which will be announced at the exhibition official opening event on 8th July from 5.30 – 7.30pm. 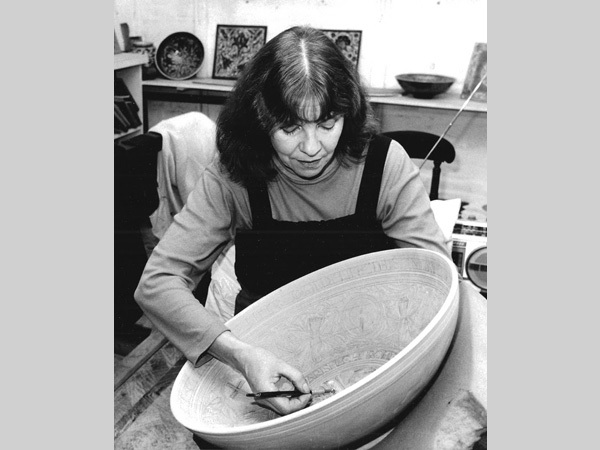 Julia Carter Preston (31.8.1926 – 6.1.2012) exhibited regularly at Bluecoat Display Centre, Liverpool’s leading contemporary craft gallery, and was also a studio neighbour. The annual exhibitions of her unique sgraffito ceramics with their beautiful lustre glazes drew large crowds of private collectors and her works were also purchased for public collections around the UK. Julia was artist in residence at Hope University, Liverpool for the last 2 or 3 years of her life, this prize exhibition is a partnership between Hope University and Bluecoat Display Centre. During her life, Julia always supported young artists, and would be delighted to know that a prize exhibition was being set up in her name, to accompany other opportunities for young and international artists, as a fitting legacy to a unique artist.